The ancient and eternally young city of Rome has many attractions. Many of these are ancient monuments that tell of the bygone days of splendour and glory. However, there are few sights that are as vibrant as the Spanish Steps. Like so many other buildings in Rome, they are the most famous of their kind in the world. They are alive due to the fact that they are used by Romans and visitors as much today as they were in the days of their completion. The Spanish Steps begin at the Piazza di Spagna – so called due to the Spanish embassy that resided here in earlier times. The Spanish Steps lead up to the nearby church- Santa Trinita dei Monti. This is a French church the construction of which was commissioned by the French King. Therefore this king also wanted the Spanish Steps to be a French construction, and this almost resulted in endless squabbles and quarrels. Ultimately, however the Romans pushed through and Pope Benedict XIII ordered the steps to be built in a Roman style - completed in 1725. They are an architectural masterpiece and almost ‘flow’ down the slope from the church to the Piazza di Spagna – divided by two terraces. The area around the Piazza di Spagna which is crossed by the Via Condetti has over time developed into a shopping district for exquisite tastes with numerous designer shops and boutiques. On the Spanish Steps or rather in their immediate vicinity, one will find significantly both the first tea-house of Rome and also Italy’s first McDonald’s branch. This expresses how the Spanish Steps were in the past and are still today a popular meeting place for young people, lovers and tourists. When the weather is good people enjoy meeting here, either for a chat with friends, or for a date with one’s girlfriend or boyfriend or one meets up here for a quick ice-cream before heading into Rome’s nightlife. 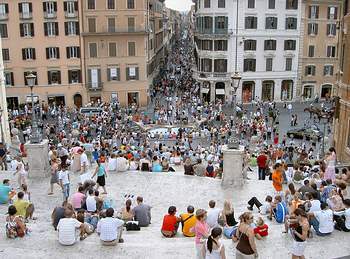 The Spanish Steps have also been used as a film setting and is a very popular photo scene for tourists. A visit to the most famous staircase in the world can not be missed on a trip to Rome. They are easily accessible via public transport e.g. using the metro – line ‘A’, station Piazza di Spagna or using the bus – route 117, bus stop Piazza di Spagna.